From putting the national flag on uniforms to starting a women's league, here are ten achievable goals for ANFA in 2010. My latest article for Goalnepal.com. No Elephant Polo in Chitwan this year - No Problem! Locals decided to organize an Elephant Football tournament instead. Looks like they also held an Elephant Sprint. Nepali archers and taekwondo left for South Korea to practice for the upcoming South Asian Games. While I used to be very skeptical of these overseas trips, in retrospect it is a good opportunity for the athletes to experience foreign training methods and hopefully pass it on on to the next generation of sportsmen. I'm becoming a big fan of the Nepal National and International Players' Association (NNIPA). In the last two weeks they protested against the improper use of Biratnagar stadium and then they dumped garbage on the NSC offices to object against the poor maintenance of Dasharath Rangasala. Shillong Lajong now have an official website. It is far better than any Nepali club website. NBA launches India specific website. Nigeria rejects Adidas uniform. When will ANFA have a proper uniform, let alone be able to reject one? Ajay Phuyal of Republica does a great job researching that Rakesh Shrestha indeed did get his 50th international cap as FIFA counted Nepal's friendly against Bhutan as an "A" international. B-Boying in Nepal. Looks cool, but is it a sport? More womens football in Nepalgunj. 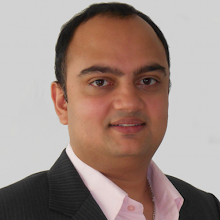 Many compliments go out to Mr. Bhoj Raj Shah who has been pushing womens football the last few years. Nepal Army continues to cry over PLA participation in domestic sporting events. Get over it soldiers! Players and Maoists take a stand in Biratnagar over the use (misuse) of the local stadium. Good for them! Morang Football Project training had to be moved from Biratnagar Stadium because of all the disruptions there, so I am very sympathetic to this cause. 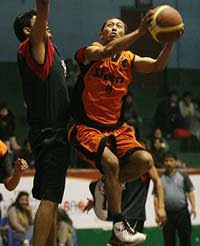 White House College, HISSAN - Morang and Anil Gurung all helping develop sports. Really love what I am seeing. Everyone needs to do their part. "At a time when its fans most needs their heroes, athletes and football players and racecar drivers have to understand that their responsibilities go beyond just winning a game or collecting their massive pay check. They carry our hopes. When they cheat on the field, they cheat us." Along with athletes, the sports authorities and clubs also have a similar responsibility. Despite all the issues we have in Nepal, sports provides a great platform to bring the country together, to get peoples' minds off of their daily troubles and to provide an outlet for people to enjoy themselves, make friends and be healthy. Sportsman and officials that neglect their duties and put personal interests first are really cheating the entire country on various fronts. The Nepal Paralympic Committee, with the support of the UN, organized a competitive race for visually impaired athletes. Another terrific article by none other than Ayush Khadka (my English sports writer of the year) on the emegence of Tharu athletes in Nepal's sports sector. It is wonderful to see articles that explore beyond the surface of Nepal's sports sector. Bishnu Auto Care has donated training equipment and offered cash rewards to the Nepal's SAG Taekwondo team. The South Asian Football Federation is considering starting a club's champions league and other tournaments. They are also contemplating the idea of South Asian players not counting against the foreign quota in domestic leagues in the region. Anyone else find it intriguing that the change in leadership at SAFF has given way to fresh and new ideas? Will the IOC require athletes to pass an ethical test before awarding them a gold medal? IOC officials might need an ethics test far more than the athletes do. India might not have to qualify for FIH tournaments as greedy FIH looks to score big with Indian sponsors. I actually think it is a great idea. Revenues generated and media interest will help field hockey develop around the world. Five of the most memorable athlete tweets of this year. I wish Nepali athletes were on Twitter. A bunch of them are on Facebook but do not write anything interesting. What is disheartening about Nepal’s football struggles is that it has been continuous for over 15 years! Other than once reaching the finals when hosting the 8th South Asian Games, Nepal has not had a single memorable run at the senior level in this time period. You can try to find all the excuses in the world on why our football team stinks, but the reason is very straightforward. Our football system is total “jharatarni”. Instead of implementing a sound football development plan we continue to resort to shortcuts and gimmicks. Is it better to not have a national team? After reading an article about Nepal's national basketball team, I was pondering - is it better not to have a national team in some sports and just play the game domestically? 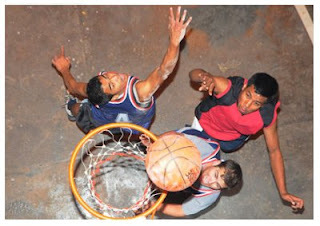 For example - Basketball is already Nepal's most popular school sport and has a positive image. Why then do we need a national team? It's not as though our players will get scouted for foreign leagues and we won't be beating a decent team any time soon. On the contrary being active internationally invites a lot of politics and freeloaders hoping for a few free vacations and buffets into the basketball sphere . Getting pasted in international tournaments risks the sport being ridiculed at home and Nepal's basketball fraternity having low morale. Maybe it is better to keep the sport simple and pure. As an American basketball fan, I love watching American college basketball and the NBA. I don't really care what the USA national basketball team does, nor do I wish for college and NBA teams to play international sides. It is not because I am inward looking or xenophobic. If you have a great thing going, why mess with it? Stunning photograph taken by Udipt Singh Chettry. 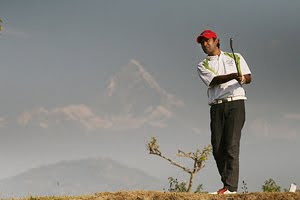 The Surya Nepal Western Open was played in Pokhara. UML held a press conference announcing formation of its sports wing. 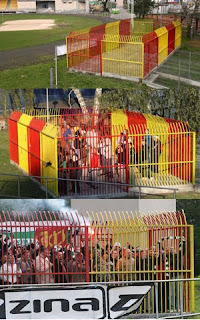 Politicization of sports will lead to nothing but trouble, kind of like what we see at college campuses across Nepal. I can easily envision political sports wings getting involved in team selection and coaching, refereeing and administrative appointments. 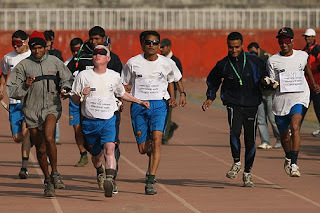 A race for the blind was organized by the Nepal Paralympic Committee. It is always great to see events that promote sports participation. In the caught me by surprise section - a cricket stadium is in the works in Pokhara. There looks to be quite a few cricket infrastructure projects happening across the country. Hopefully once the facilities are built they will be well utilized and help decentralize cricket from Kathmandu. Cyprus Tourist Organisation is hoping that placing ads at English Premier League matches will help bring in Asian tourists to the Mediterranean country. Despite not being as high profile as the English, Spanish and Italian leagues, the German Bundesliga has the highest attendance of any league in the world. ESPNStar's John Dykes writes a very informative article about the world of football agents. Nepal flopped at the recent ACC Twenty20 Cup, failing to advance past the group stages in a tournament where they were one of the favorites. It is always tough to predict "Associate level" cricket as a majority of the teams are packed with players of Indian and Pakistani origin. In some cases, players are recruited directly from the subcontinent, therefore it is hard to judge how strong a side will be. Nepal's team however consists fully of home grown players, thus often one hears grumblings that the cards are always stacked against us. For me it's a non-issue. If you want to play top class cricket against the likes of India and Pakistan, you better be able to defeat sides comprising of "C" grade Indian and Pakistani players. Nepali institutions are really starting to grasp the concept of sports tourism and how the two genres can work together. Recently, the Nepal Amateur Athletics Association were awarded the Asian Cross-Country Championships. It is scheduled for 2011 and will coincide with Nepal Tourism Year. The International Elephant Polo Championship will be held at Bardia National Park for the first time. Promoters hope the move will help develop tourism in the area.